She had to call. You can’t just ignore a phone that calls into the past. You can’t know it’s there and not call. In her three previous books, Attachments, Eleanor & Park, and Fangirl, Rainbow Rowell has demonstrated an ability to create characters that are as recognizable as real people. She has proven herself adept at writing all kinds of relationships – romantic and otherwise – for characters in high school, college, and early adulthood. 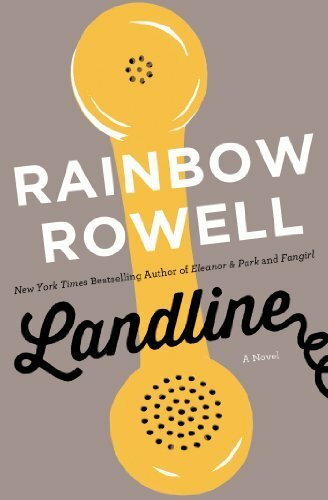 In Landline, Rowell leaves the YA realm and returns to the adult world, delving into the marriage of Georgie McCool and Neal Grafton. Georgie and Neal meet in college, marry at twenty-three, and have two children. Georgie works as a TV writer with her friend Seth, who has been her writing partner for longer than Georgie and Neal have been together. Georgie and Seth are on the verge of achieving their longtime dream of getting their own show, but there’s a catch: they have to have material ready in a matter of days. But it’s almost Christmas, and Georgie is supposed to go with her family to Omaha for the holiday. Instead, Georgie stays in California to work on scripts with Seth while Neal takes their daughters to Omaha. Georgie’s mother and sister treat her as though Neal has left her, which is not what Georgie thinks has happened at all…or has it? Georgie begins to fall apart. She can’t get in touch with Neal on the phone, until she tries calling from the old landline phone at her mom’s house. Talking to Neal on the phone brings back old memories of their time in college, and the terrible week when they were broken up, before he drove twenty-seven hours back from Omaha to California and proposed to her on Christmas morning. Georgie can’t remember that week very well, but as she talks to Neal, pieces she didn’t know were missing begin to fall into place. The plot hinges on two phones: Georgie’s dead cell phone, and the landline (a.k.a. the magicfuckingphone). I found the landline, where present-day Georgie talks to past Neal, much easier to go along with than the idea that a responsible adult with children would let her cell phone die as often as Georgie did. But that’s my one complaint. Rowell has an incredible depth of understanding of her characters, and of marriage generally, but she also has a lovely light touch: there are plenty of funny, witty moments alongside (and sometimes during) the darker, bleaker ones. At one point, Georgie realizes that even though Neal is perfect for her, she might not be perfect for him; that “she wanted him more than she wanted him to be happy.” Throughout the novel, Georgie wrestles with big questions like these. She has always known what she wanted: a career in TV, Neal, and her kids. Neal has never really known what he wanted, except for Georgie. Seth adds another layer of tension to Georgie and Neal’s relationship: there’s no love lost between Seth and Neal, but they’ve maintained a tense truce all these years, for Georgie’s sake. Is Seth ready to break that truce? Readers may occasionally pause to dwell on issues of feminism. (Georgie wanted to take Neal’s last name, but he wouldn’t let her, because “You don’t come into this world with a name like Georgie McCool and throw it away on the first pretty face.”) In the McCool-Grafton marriage, Georgie is the careerist, the breadwinner, the busy one, while Neal is the stay-at-home dad; Georgie’s own sister points out that Neal would get custody in a divorce. But the novel doesn’t read like a book with an agenda; it only presents a scenario that is the reverse of the traditional one. Rowell is as magical as her landline phone. Georgie and Neal’s marriage, with all its history and weight, comes through clearly: their good moments and bad moments, the joys and stresses, the selfishness and compromises. Georgie and Neal recognize that they may not be perfect for each other, that their lives might not “fit together,” but, as Neal says, “Nobody’s lives fit together. Fitting together is something you work at. It’s something you make happen – because you love each other.” Stranded half a country away from Neal and her kids, Georgie has to figure out how to make it happen. I had incredibly high expectations for this book, and though high expectations often lead to disappointment, that wasn’t the case here at all. Instead, I was wholly delighted, and I think Rowell’s fans will be too. In fact, moving seamlessly between YA and adult, she’s likely to bring her old fans with her and attract some new ones as well. I received an e-galley of LANDLINE from publisher Macmillan via Edelweiss. The expected publication date is July 8, 2014. Quotes in the review above are from the galley, not the final copy.